« who’s that travelling salesman path?! When the goal of a book is to make measure theoretic probability available to applied researchers for conducting their research, I cannot but applaud! Peter Veazie’s goal of writing “a brief text that provides a basic conceptual introduction to measure theory” (p.4) is hence most commendable. 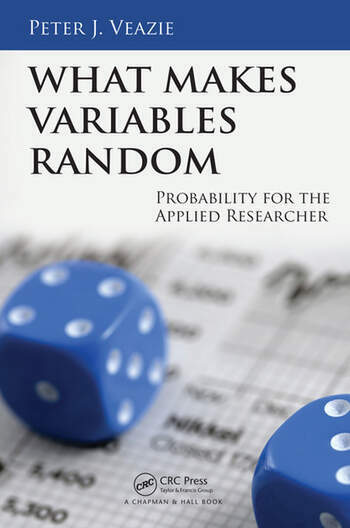 Before reading What makes variables random, I was uncertain how this could be achieved with a limited calculus background, given the difficulties met by our third year maths students. After reading the book, I am even less certain this is feasible! does not appear to be defined at all. This entry was posted on July 19, 2017 at 12:17 am and is filed under Books, Mountains, Statistics with tags Bayesian Analysis, Bertrand's paradox, conditional probability, introductory textbooks, σ-algebra, Lebesgue integration, Riemann integration. You can follow any responses to this entry through the RSS 2.0 feed. You can leave a response, or trackback from your own site. Having both read this book and known the man who wrote it for 17 years now, I would like to respectfully disagree with your review. It is not in the content of your critique that I disagree, as most of it is logically and mathematically sound based on your assumptions. My disagreement stems from the point of view the critique is written from. I am a perfect example of the target audience of this book (hence my reading of it before it was officially published), and I found that it clarified my understanding of both measure theory and probability models to an order of magnitude higher than before reading this book. As you are a statistics professor, it is understandable that you would take issue with the manner in which certain issues are introduced, as would any teacher with their own particular teaching style. At the level that this book is attempting to reach, the usage of discrete examples and models through much of the book is perfect for those with a limited calculus background. Continuous variables would require more extensive calculus, and it is not unreasonable that an applied researcher with limited calculus knowledge would rarely encounter continuous variables. The definitions discussed in your criticism of chapter 3 also make sense from the perspective of an applied researcher. I have personally rarely encountered the necessity for infinite sets in my work. Finite sets are much more applicable to real world research, which is the obvious focus of this book (considering its target audience of “applied researchers”). In fact, much of the criticism you level at this book can be boiled down to looking at this from a pure math perspective, as opposed to applied research. To conclude, I would like to state that you would be surprised at the lack of understanding of many concepts in this book by applied researchers. Myself and my peers have become increasingly reliant on allowing computers to “plug and chug” our data into models, without actually grasping why these measures work the way they do. This book helps explain that in the context of the work that we do.